February: What’s up on the Hill? Radar Hill was chosen from several applicants to construct the new website for the Victoria Real Estate Board. This project represents a major milestone for our company and recognition of our position at the forefront of Responsive Web Design and data processing. Hundreds of listings and thousands of photos are appended on an hourly basis and displayed in a format that is fully optimized across all screen sizes. With nearly 60,000 page views per month we were challenged to maximize download speed, retain data integrity, and display it in an attractive presentation across all viewing devices. Ten Year Anniversary: Megan Newhouse, our Director of Awesomeness, is celebrating her ten-year anniversary with Radar Hill this month. Since she joined us, Megan has gotten married, bought a house, and given birth to two children. Her most recent is Declan, born Saturday January 17, weighing 7 pounds, 10 ounces. He is a baby brother for Kieran. Congratulations Megan, thank you for being an invaluable part of our team over the past decade, and see you when your maternity leave ends. Five Year Anniversary: Graphic Designer Ken Hamilton is celebrating five years at Radar Hill. Congratulations Ken! As a break from creating awesome websites, Ken likes to display his musical talent playing banjo and guitar in the office. More Musical Talent: Graphic Designer Julie Melano plays percussion, which includes snare drum, bass drum, cymbals, triangle, tambourine, and drum sets, with the Greater Victoria Concert Band. She has some spring concerts coming up. If you have musical talent and want to join, the band is always looking for more musicians. A Groupie and a Roadie: Graphic Designer Mike Culhane is a groupie and a roadie. His wife and father-in-law play in The Burton Bunch, this month’s Band of the Month at the UVic Student Pub. Mike has been there every Wednesday night, supporting and helping setup and takedown. Not a Player, but a Racer: Back in November, Programmer Shannon Graham organized an alleycat race, sponsored by our client Accent Inns. Read her story:Racing the Alleys of Victoria. Kendra’s Knee: Our Google Specialist Kendra Savich went into surgery on Tuesday to have a loose body removed from her knee that has been interfering with her walk since high school. It was a simple laparoscopic procedure, and after recovering from her anesthetic, was back in the office on Thursday. She thanks everyone at Victoria Surgery for being extremely professional and welcoming, and Dr. Nelson from ReBalance for performing the procedure. For the time being she is keeping her leg propped up at her desk and is using a crutch to help with stairs. 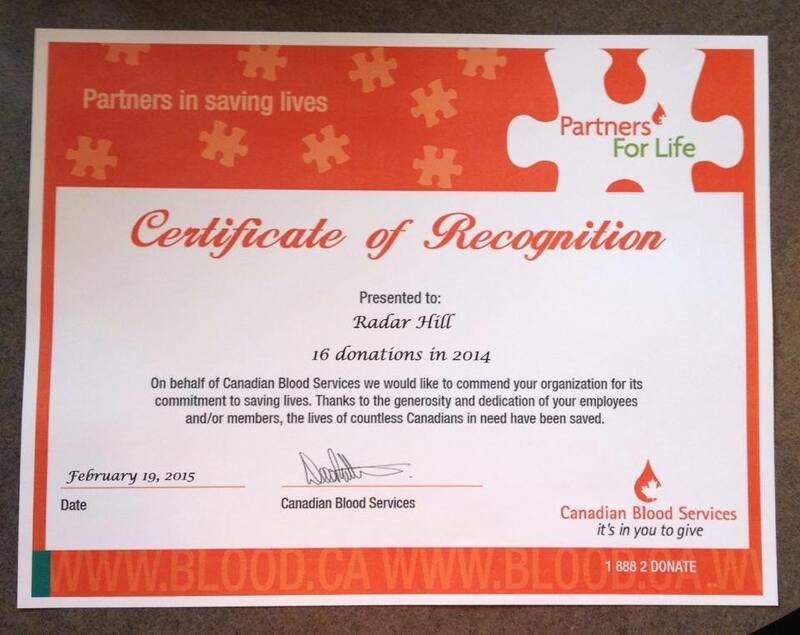 Blood and Recognition: On behalf of Radar Hill, Client Care Coordinator Jennifer Dempsey attended the Partners For Life Recognition Lunch presented by Canadian Blood Services on February 19th. As part of the Partners for Life program, we pledge how many blood donations we will make. Last year we pledged 15 and exceeded our goal with 16 donations! Canadian Blood Services thanked us, along with many other companies that are part of the program, with a lunch in the Ivy Ballroom at the Fairmont Empress Hotel. Guest speakers included members of the McSweeney family, three of whom would not be alive today if it wasn’t for blood donors. It was touching to hear their stories and reflect on how thankful they are to be alive thanks to donors. Utilize ammonia heat pumps to heat a housing community and is one of only a few ammonia based air conditioning systems. Arts Award: Author Michelle Mulder received the 2014 Children’s Literature Roundtables of Canada Information Book Award. for her book Pedal It. Concussion Testing: Ashley Nelson, Certified Athletic Therapist with Start Line Health and Wellness Group will be heading up a concussion program which involves pre-concussion testing, post-concussion testing, and rehabilitation services. If you have a child in sports where concussions are likely to occur (soccer, hockey, rugby) or know of a sport team that would like pre-concussion testing, contact Ashley at Start Line: 250-746-7463. Join us in Duncan for An Introduction to Google Analytics, Wednesday, 4 March, 10:00 am, at Dynamic HR Solutions, #204 – 64 Station Street, Duncan. Learn the basics of Google Analytics from our Google-certified specialist and become familiar with how to make sense of all this for business-building information |Details and registration… Need a promo code? Radar Hill clients receive discounts on all sessions and workshops of between 50% and 100%. March 5: What’s Behind the Chocolate Cake? with Suzanne Simcox of Rock Solid Leadership. Learn about the different types of distractions and how they could be affecting performance, productivity, and relationships. March 12: Overtime 101 with Alan McEwen, HRIS/Payroll consultant. Are you paying the right amount for overtime? This entry was posted in At Radar Hill, Newsletters, Our Staff, Real Estate, Workshops & Seminars. Bookmark the permalink.